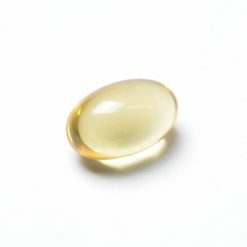 Highly safe and pure fish oil. Bulk Sports manufacturers use only high-quality raw ingredientsthat must pass rigorous quality control testing. 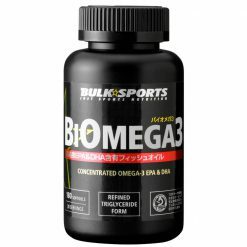 The production of BiOmega3 was a particularly long and meticulous process. We spent a long period of time on procuring and inspecting various ingredients for quality. 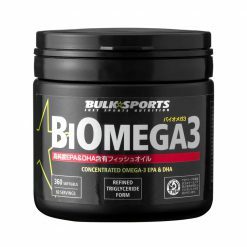 Ultimately, we ended up excluding two other candidates that did not pass the quality inspection and are proud to present the completed BiOmega3 to you at last. It is especially useful for athletes trying to lose weight and can be taken in combination with other supplements, such as CLA. Not only is it safe and high quality, but it is also a very affordable fish oil supplement. It’s an investment worth making because fish oil supplements are considered to be one of the most important health supplements on the market. Taking 6 to 18 soft capsules daily is the general recommendation. We encourage taking it after a meal. After opening, please make sure to use it prior to the expiration date. Athletes aiming to lose weight should not use more than 1 per day so as to avoid exceeding target total energy intake. Take 6-18 capsules daily. Use as soon as possible after opening prior to expiration date. Keep refrigerated once opened since fish oil easily oxidizes. Consult a doctor before use if you are taking anticoagulants, have a risk of excessive bleeding, or are taking any medications.